Nothing is as costly to an manufacturer as a field-failure. Due to testing constraints, assembly professionals often have unresolved questions regarding the integrity of post-assembled parts and products. AIM’s Reliability Analysis Program provides analytical services such as solder joint and cleanliness analysis to ensure the integrity and reliability of these parts and assembled products before a failure occurs. 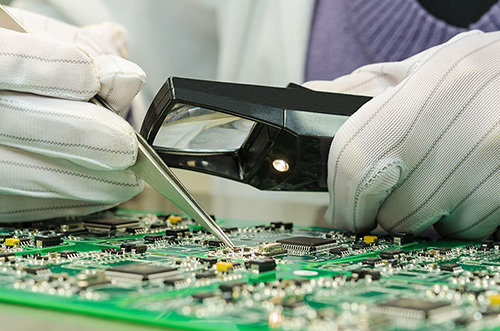 By cross-sectioning PCBs and analyzing their solder joints, AIM has the capability to provide the assurance that these solder joints are acceptable and offer advice on how to improve the quality of less-than-acceptable solder joints. AIM’s complete organic laboratory has the ability to test PCBs for potentially harmful substances and interactions. Customers with concerns about the reactions of the various materials of a PCB with residues, salts, oils, etc. are invited to submit materials to AIM to be tested for compatibility, safety, and durability. Once reviewed, our technical department will offer recommendations in order to minimize the possibility that a product will experience a failure during its lifecycle.